WHAT LINES DEFINE your world? Horizontal or vertical? Perhaps you’ve never considered that question. But ponder that for a minute. Where do you live? Where do you work? What lines define your environment? Do you live in the city, the country or a small town? Do you live on the prairie, in the mountains or somewhere in between? My world has always been horizontal. I prefer it that way—flat and unbroken by vertical obstacles. Towering buildings overwhelm me; make me feel small, visually overpowered and uncomfortable. Can you understand that? Perhaps if you grew up or live in a rural area, you do. 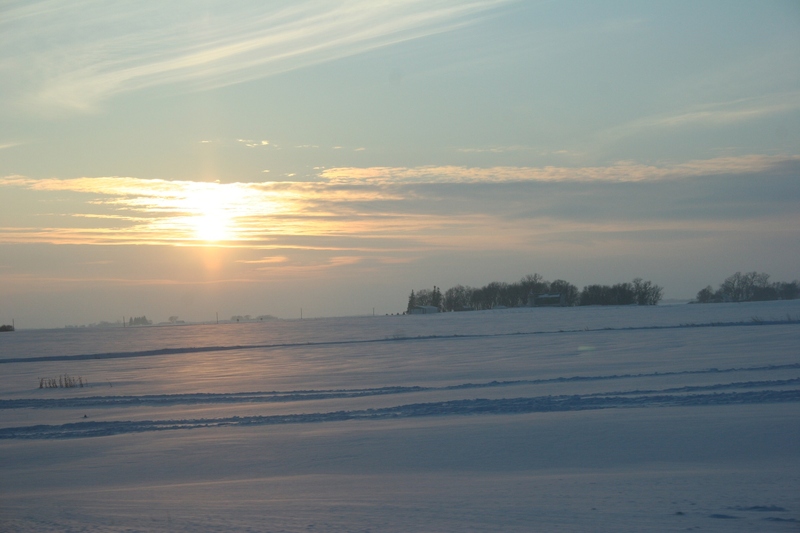 The sun sets on my native southwestern Minnesota prairie in this December 2010 image. I traveled to Chicago once during college, and to New York. While touring the garment district in the Big Apple, I was nearly flattened by a vendor pushing a rack of clothing as I paused on the sidewalk to gawk at the skyscrapers. In Chicago, I struggled with sleeping in a hotel that stretched too far into the sky. 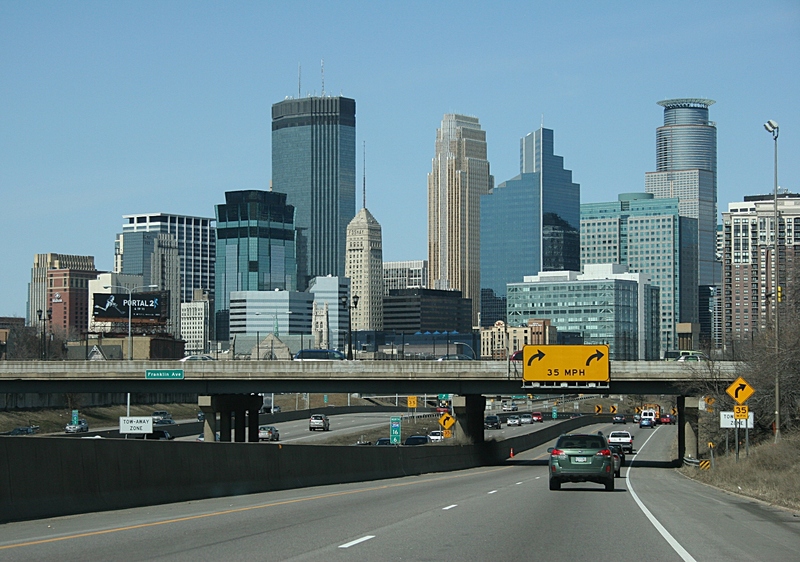 A view of the Minneapolis skyline from Interstate 35. I can’t recall the last time I visited downtown Minneapolis, but I’m certain it’s been decades. I’ve never been to any other big cities and I have no desire to travel to them. Some of you will say I am missing out on culture and shopping and so much more by staying out of the city. You would be right. But to counter that, I will tell you many a big city resident fails to leave the confines of the city to explore the small towns and rural areas that offer grassroots culture and shopping and much, much more. I am not trying to pit city against country, horizontal against vertical, here. Rather, I’d simply like you to think about your world from a visual perspective. Then, tell me, what lines define your landscape? Vertical or horizontal, or a mixture of both? Even in rural Minnesota, vertical lines occasionally break the horizon, like this scene at Christensen Farms along U.S. Highway 14 east of Sleepy Eye in southwestern Minnesota. 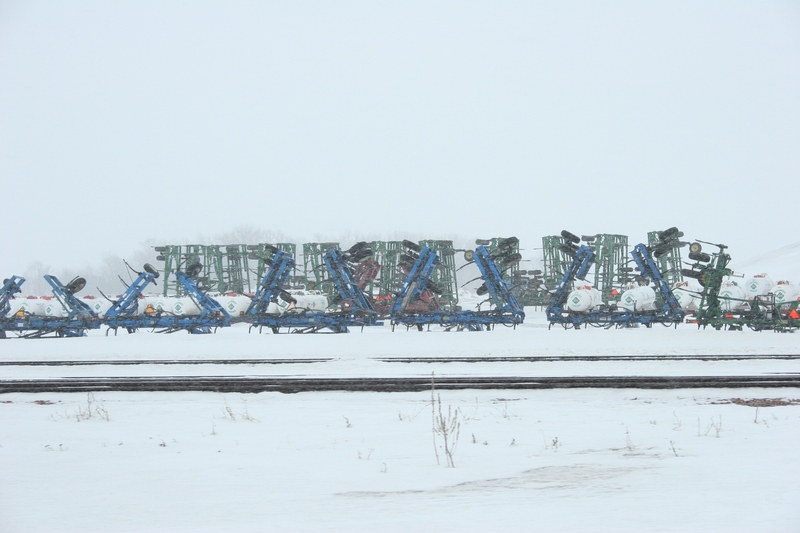 The strong horizontal lines of railroad tracks and trains cross the flat prairie landscape of southwestern Minnesota. I shot this along U.S. Highway 14 between Springfield and Sleepy Eye as snow fell late on a March morning in 2011. Railroad tracks and diggers slice precise horizontal lines across the landscape in this March 2011 image shot while traveling U.S. Highway 14 between Springfield and Sleepy Eye, in my native southwestern Minnesota. 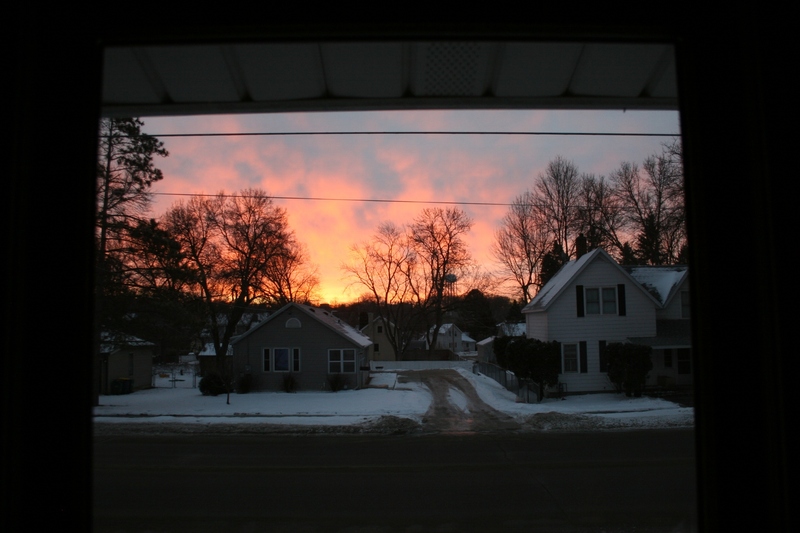 I live in Faribault, an hour's drive south of Minneapolis along Interstate 35. While I certainly don't consider Faribault, with a population of around 22,000 to be a small town, it's definitely not urban. I shot this pastoral scene last spring several miles west of town near Roberds Lake. 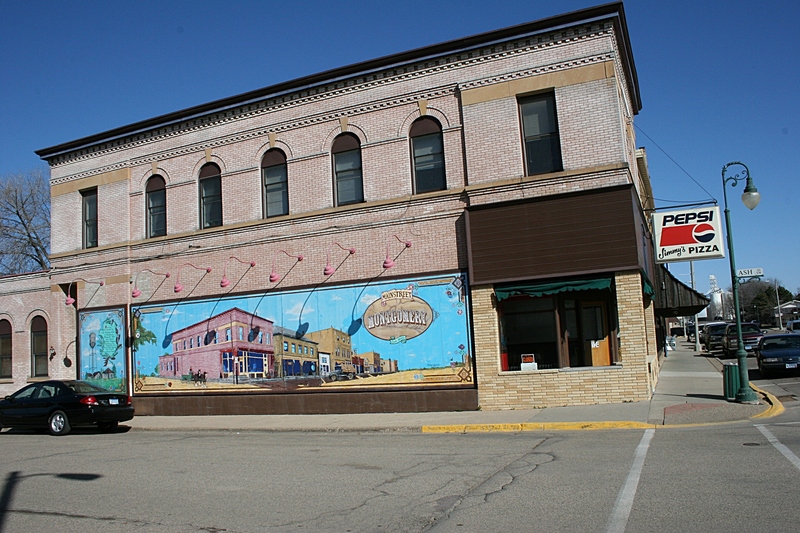 DRIVE INTO MONTGOMERY or New Richland, Ellendale or West Concord, or many small Minnesota towns, and you’ll find grassroots art, my term for Main Street murals. It’s art that’s out-front and public, depicting the history and feel of a community. Such murals typically offer a visual snapshot of the past, impressing upon visitors and locals a defined sense of place. In Ellendale, for example, a locomotive and depot comprise about a third of the 16-foot by 32-foot mural on the side of the Ellendale Café. 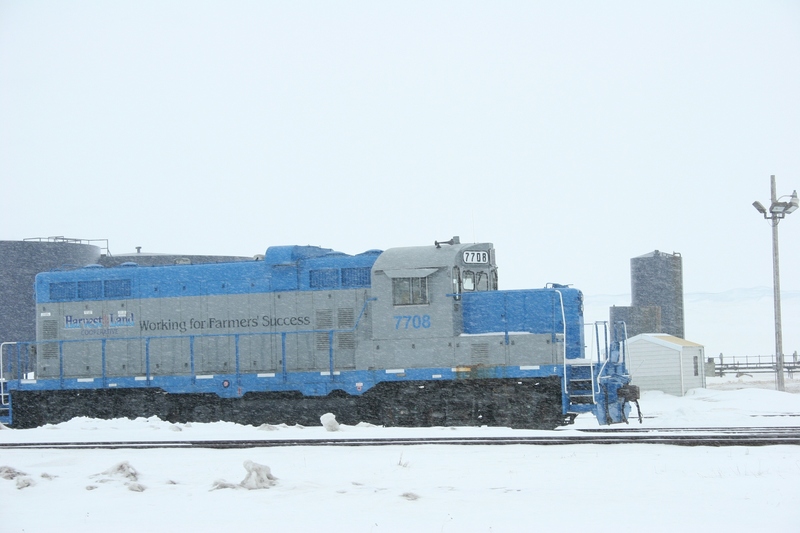 The train points to the community’s roots as a railroad town, established in 1900 when the Burlington, Cedar Rapids and Northern Railroad passed through on its way to Minneapolis. Ellendale is named after the railroad president’s wife, Ellen Dale Ives, known for her humanitarian works. The Ellendale Centennial Mural photographed last summer. 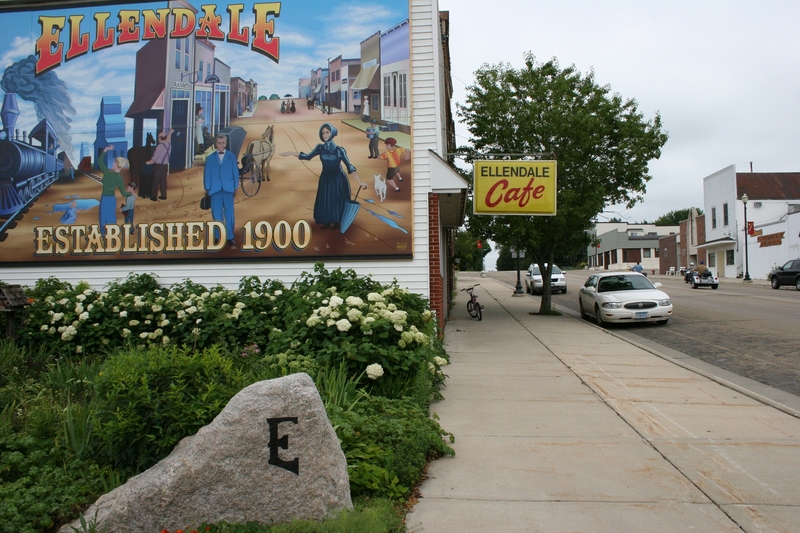 The Sweere brothers of the Twin Cities-based National Mural Company and natives of nearby Owatonna painted the 1999 Ellendale Centennial Mural. The city section of the mural stretching along the side of the New Richland post office. 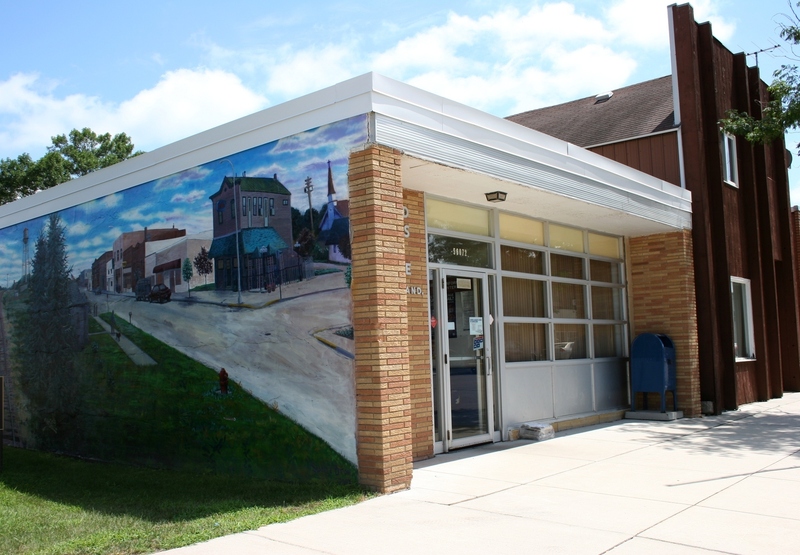 In neighboring New Richland, the Sweere brothers also created the 12.5-foot by 65-foot mural brushed onto an exterior cement block wall of the post office. In this 2003 grassroots art, train tracks visually divide the mural into city and country scenes. It is a point this community emphasizes—not the division of the two, but the link between rural and town. 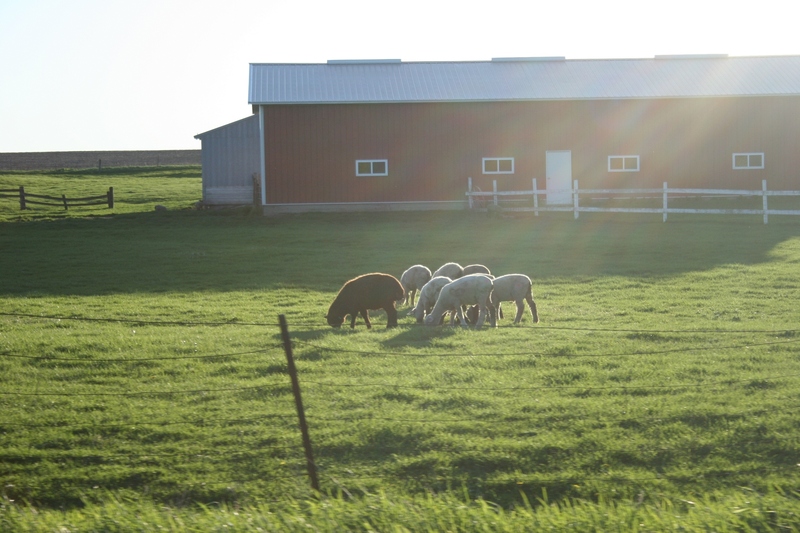 Each July this Waseca County town of 1,200 celebrates Farm and City Days. The rural portion of the New Richland mural. Should you be interested in moving to New Richland, you might want to click here and check out this deal: The city is offering free land to individuals looking to build a new home in the Homestake Subdivision on the northwest side of town within a year of acquiring the deed. (Note that you’ll need to pay the special assessments.) Just thought I’d throw that land offer out there. 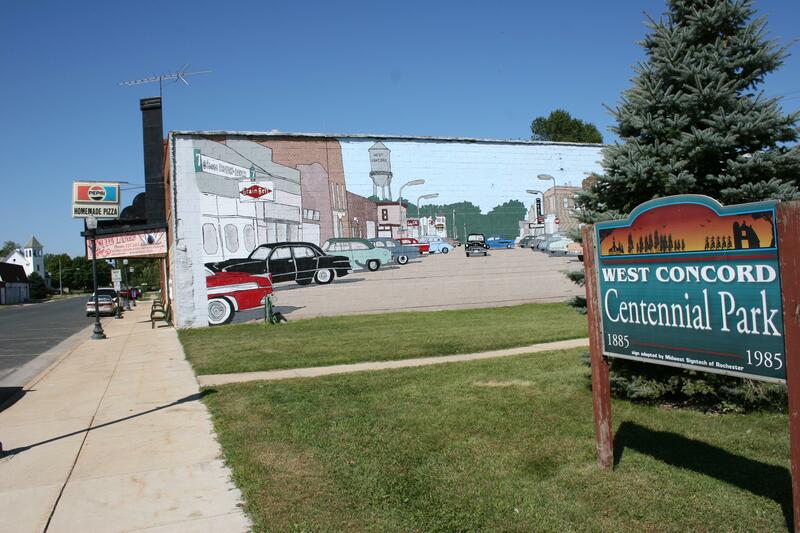 A 1950s version of West Concord is showcased in the mural on the side of a bowling alley. To the east, over in West Concord, cars, not trains, define that town’s mural on the side of Wescon Lanes next to West Concord Centennial Park. The art depicts a 1950s street-scape, a nod to a community that celebrates summer with weekly car cruises and an annual West Concord Historical Society Car and Truck Show in July. Just down the street, you can shop at Woody’s Auto Literature and More. 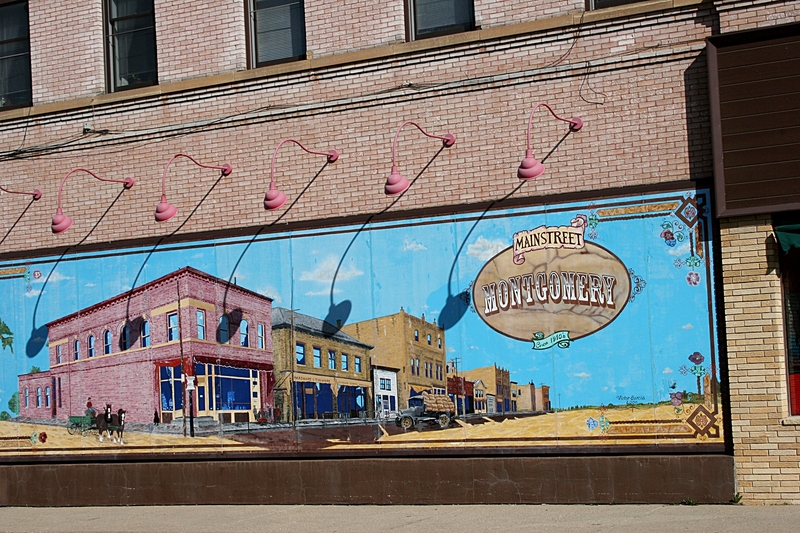 Traveling back west over to Montgomery in Le Sueur County, you’ll spot a mural of Main Street just across from famous Franke’s Bakery, known for its kolacky (Czech pastry). Local sign-painter Victor Garcia painted the scene based on an early 1900s photo of this town founded by Czech immigrants. So there you have it—abbreviated visual histories of four small southeastern Minnesota towns showcased in grassroots art. Think about that the next time you see a mural. 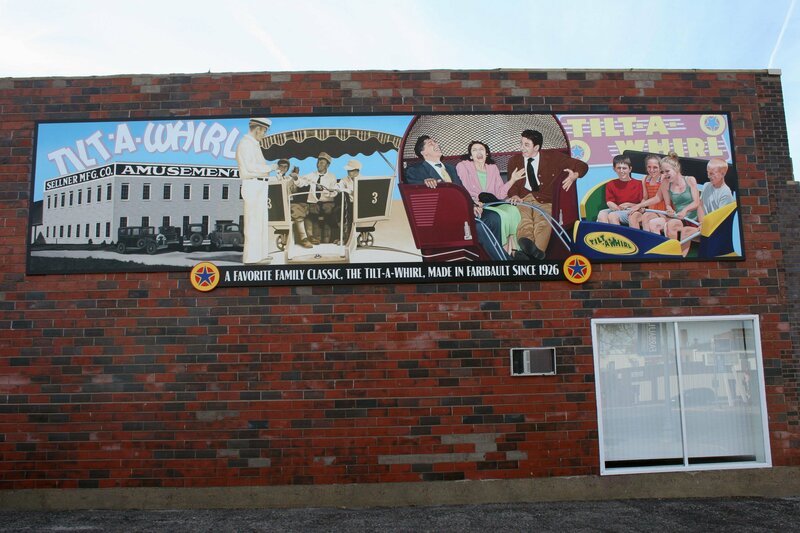 The Mural Society of Faribault created this mural honoring the Tilt-A-Whirl amusement ride, made in Faribault since 1926. Today Gold Star Manufacturing still produces the fiberglass cars for this ride. 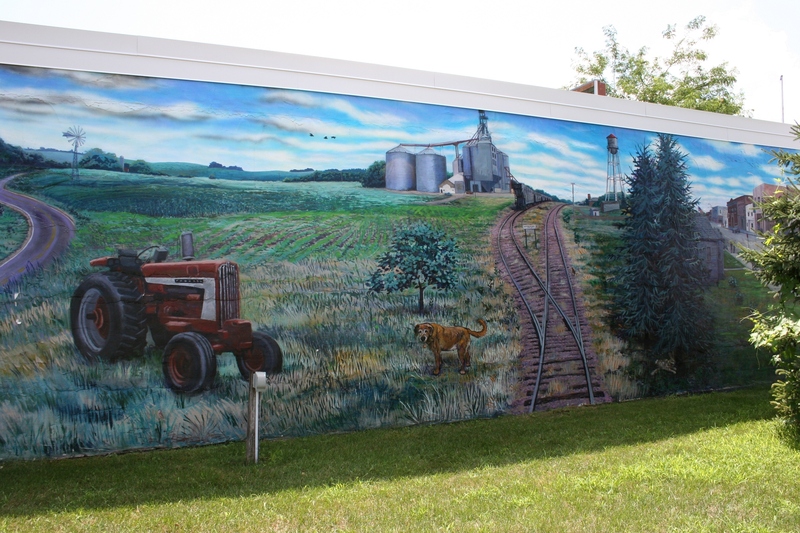 DO YOU KNOW of any small towns that tell their stories via murals? In Faribault, where I live, five murals are posted on buildings in the downtown area. With a population of more than 20,000, Faribault isn’t exactly a small town, not from my perspective anyway. If you’re ever in the area, be sure to peruse the murals which depict differing aspects of this city’s history. GROWING UP, I ALWAYS wanted to play the piano. But I never had the opportunity, although one Christmas I received a toy accordion that temporarily satisfied my yearning to create music. There was neither money nor space for a piano within the budget constraints of a poor farm family or within the walls of a cramped southwestern Minnesota farmhouse. And so the years passed without music. During junior high school I struggled through required music classes, once fake-playing the ukulele at a Christmas concert because the music teacher failed to recognize that I could not read musical notes. In high school when so many classmates were joining band, I was not among them. Remember that money issue? Still there. A few years later my younger siblings were allowed to join band—one sister choosing the flute, the other the clarinet. The brothers focused on sports. For awhile I tried to play my sister’s flute, without much success. During college, a friend allowed me to strum her guitar. The strings bit into my fingertips so I quickly lost interest. Years later when I had children, I was determined they would have the musical opportunities I never had. I started them on a mini toy organ. Later, the eldest tried playing my sister’s flute for awhile, then quit. The second daughter borrowed my youngest sister’s clarinet, sticking with band lessons for several years. My son had no interest in an instrument until recently, when he inquired about playing the guitar. He’s meeting with a family member soon to try out guitar-playing. I tell you all of this because of a recent musical opportunity that came my way. It’s ironic really, given my inability to play any type of instrument or, in fact, read a single musical note. If you put a song sheet in front of me right now, I’d stare at it like I was reading Greek. But composer Curtis Lanoue, also an elementary music teacher and the director of music at Lord of Life Lutheran Church in Miami, found the music in my soul. 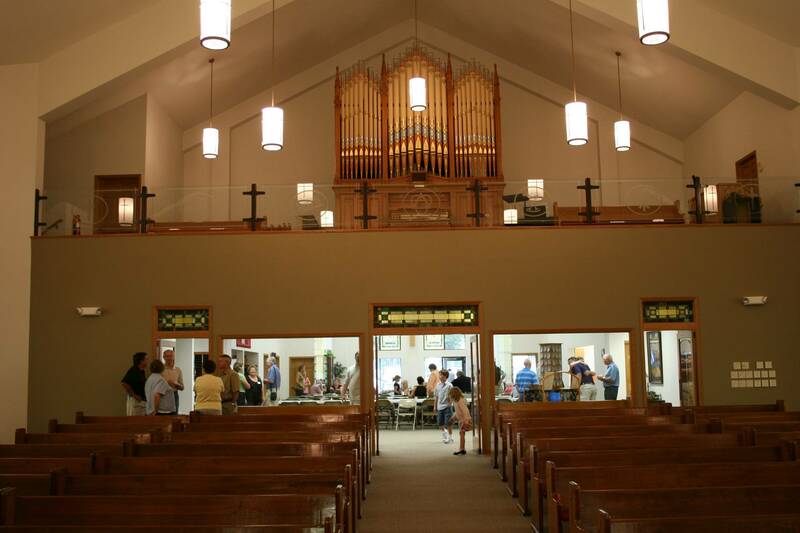 Seeking a cover photo for his 29-page Four Organ Preludes Based on Common Hymn Tunes book, Lanoue did an online image search and discovered my photo of the old pipe organ at Immanuel Lutheran Church, rural Courtland, Minnesota, the congregational home of my maternal forefathers. 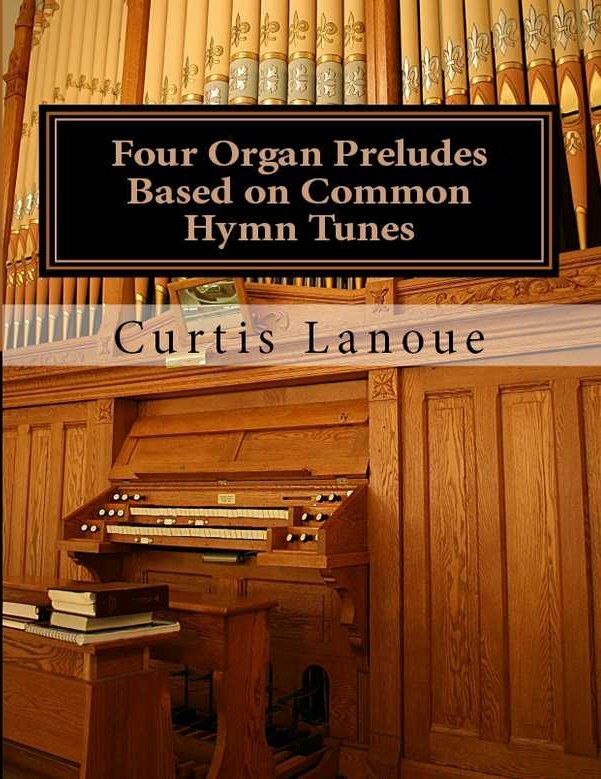 Once I received a copy of this musician’s recently self-published book, I understood why he selected my photo of Immanuel’s organ that was built in 1895 by Vogelpohl and Spaeth Organ Company of New Ulm at a cost of $1,500. As I flip through these compositions written by a musician with degrees in jazz performance and studio jazz writing and experience as a working organist since age 16, I can only smile at the contrast between his vast musical knowledge and talent and my musical illiteracy. Disclaimer: I am expecting payment for use of my cover image and have received a free copy of Lanoue’s book. This post, however, has been written solely at my discretion. 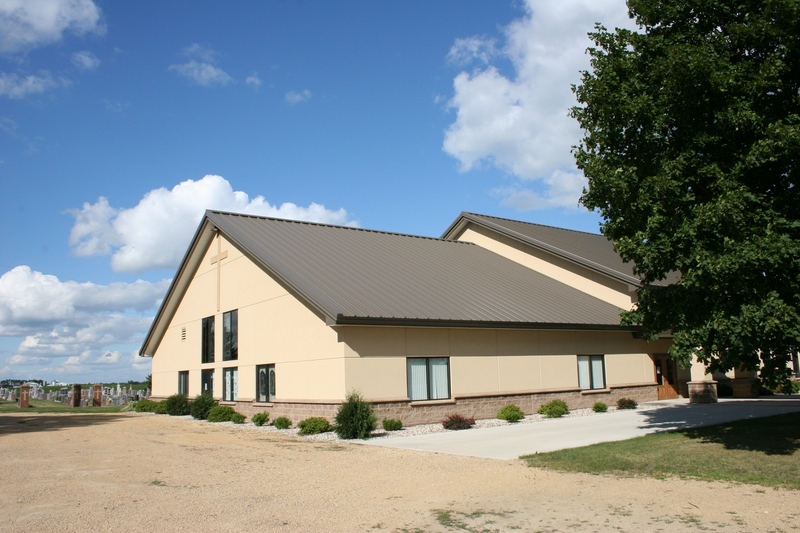 A rear photo shot of Immanuel Lutheran Church, Courtland, looking up to the balcony (where the 1895 pipe organ is located) and toward the spacious fellowship hall. 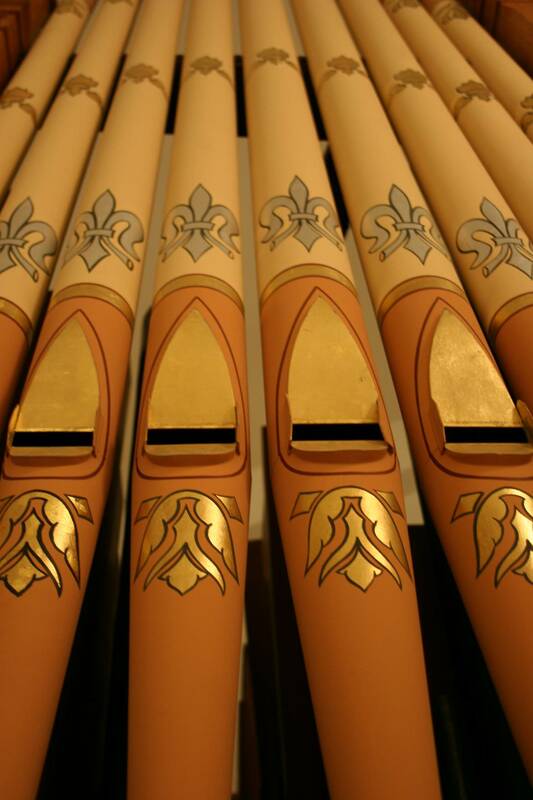 The beautiful pipes on Immanuel's organ. The 1895 organ was renovated in 1988 at a cost of $25,000. When Immanuel built a new church in 2007, Rollie Rutz and crew from Rutz Organ Company in Morristown (about 10 miles from my Faribault home), helped move the organ from the old church into the balcony of the new sanctuary. A set of chimes was added to the organ in 2007. Immanuel’s organ is today valued at around $200,000. I’ve heard the organ played in Immanuel and I agree. The acoustics in the new house of worship truly showcase the sounds of this 117-year-old organ played each Sunday by Lisa (Bode) Fischer, the daughter of my mom’s first cousin and a descendant of the Bode family members who helped found this rural congregation in the Minnesota River Valley more than a century ago. 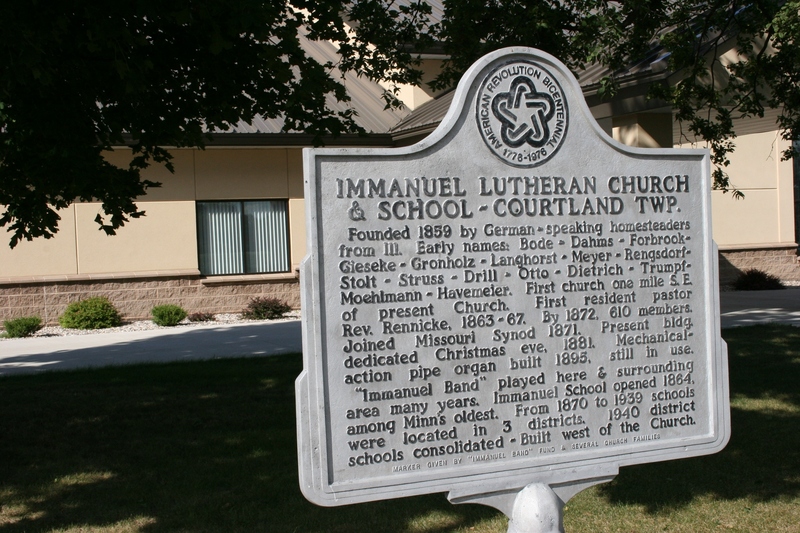 A historical sign outside of Immanuel Lutheran Church, east of Courtland, Minnesota. This photo, taken in September, shows primarily Immanuel's social hall and the adjacent cemetery where many of my Bode forefathers are buried. A view of Immanuel's sanctuary from the balcony. 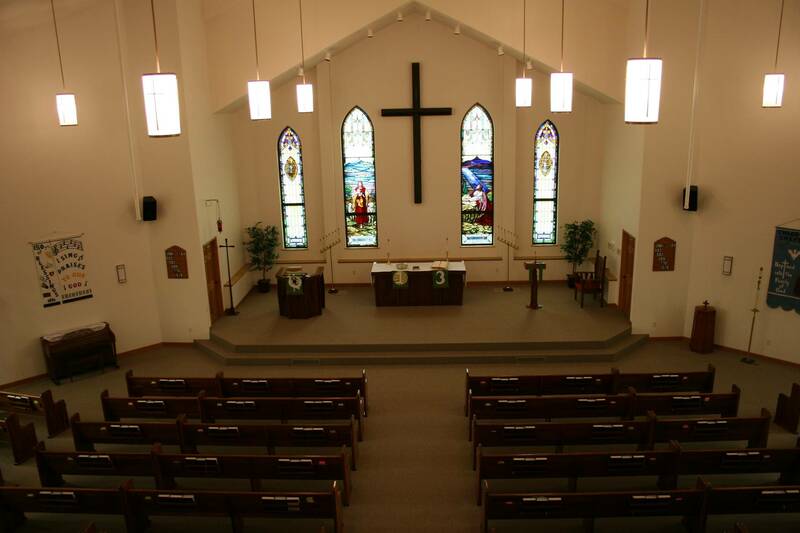 The pews, the chancel furnishings and the stained glass windows from the old church were incorporated into the new church. I RECENTLY READ somewhere—and I read a lot—if you want to make God laugh, plan your day. Well, God must have been rolling on the floor, laughing until he cried and his belly hurt on Thursday because I had one of those days. You know, the kind that veers completely from your intended course of action. My main goal for the day was to finish pulling together financial information for the professional who completes our taxes. Now those of you who know me, either personally or via this blog, realize how much I detest numbers. Math whiz I am not. And to add to the stress this year, I once again need to file a Free Application for Federal Student Aid after a two-year respite. I despise forms, especially when numbers comprise the bulk of the required information. I never got to the numbers on Thursday. Rather, I spent most of my morning researching information for a document my husband needs for a church meeting on Sunday. I’m happy to help him, but I never thought the project would consume hours of my time. I expect God was getting a chuckle out of that, his subtle reminder that perhaps I should give just a little more of my time to him. The rest of the day slipped away in work-related issues with precious little time for writing. Have you noticed the repeat of the word “time” in all three of the above paragraphs? Why am I so obsessed with time? Despite my day failing to go as planned, I knew I had a delightful evening ahead. My husband and I had been planning for weeks to attend a presentation by Minnesota photographer Doug Ohman who has published a series of “Minnesota Byways” books. But then, 50 minutes before Ohman’s talk, my husband called. The car had broken down on his way home from work and he needed a ride and a tow. After a late supper, kitchen clean-up and e-mail catch-up, I finally kicked back in the recliner to finish the final chapters in Still Standing: The Story of SSG John Kriesel by John Kriesel as told to Jim Kosmo. He was right, of course. Put in the perspective of all the problems and tragedies a day can bring, my Thursday rated as just fine, thank you. My legs weren’t blown off in a roadside blast. I wasn’t fighting to live. None of my friends had been killed in Iraq. Minnesota National Guardsman Kriesel had dealt with all of that and managed to overcome, to be positive, to move forward with his life. His story is about as inspiring as any you’ll ever read. And then, when I finished that book Thursday evening, I picked up Conversations with the Land by Jim VanDerPol, a Chippewa County farmer and writer. I’m only a few essays into his book, but already I appreciate the approach he takes to the land and to life in general. He pauses to notice, to savor, to value his land and his role as tender of the earth. His writing resonates with me, reconnects me to the prairie of my youth, the land that still influences my writing. And so my Thursday ended and a new day has begun with a sunrise so splendid that my husband called to tell me about it, as he often does when the morning sky is especially beautiful. The remnants of today's sunrise as viewed from my office window. spreading gold and pink across the sky like jam on toast. to delight in sunshine and rain and succulent fruit plucked from vines. PERHAPS TODAY should be the day I finish this poem. 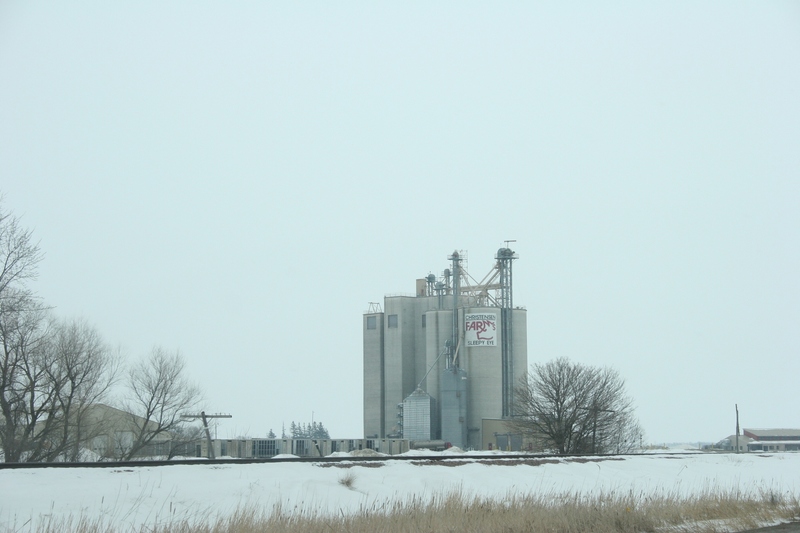 I GREW UP on the southwestern Minnesota prairie, a mostly flat land vertically-interrupted only by small-town grain elevators and water towers, by silos and groves of trees hugging farm sites. I never felt hemmed in. How could I feel confined under an endless sky in a land that stretches into forever, nearly unbroken before your eyes? Perhaps that will help you understand why I sometimes struggle with trees. I’m not talking a tree here, a tree there, but trees packed so tight that they become a forest. Dense. Black. Blocking views. I need to, have to, see the land spreading wide before me if I’m exposed for too long to miles of thick woods. Likewise, I prefer my land flat. All of that said, time and age and exposure to geography beyond the prairie have resolved some of those space and landscape issues for me. I can, within limits, appreciate terrain that rolls and rises, trees that clump into more than a shelter belt around a farmhouse. I can appreciate, too, geological anomalies like Ship Rock, a natural formation jutting out of seemingly nowhere from the trees that crowd State Highway 21 in Adams County near Coloma in central Wisconsin. 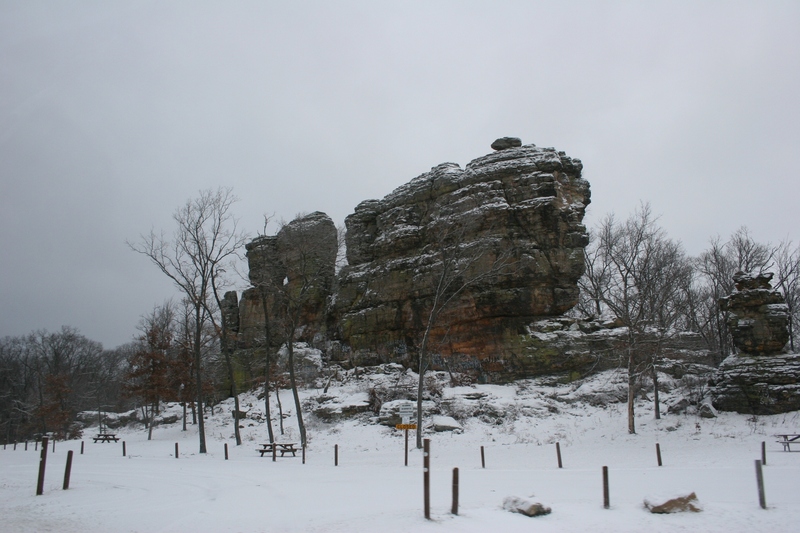 Ship Rock is located next to Wisconsin Highway 21 in the central part of the state. 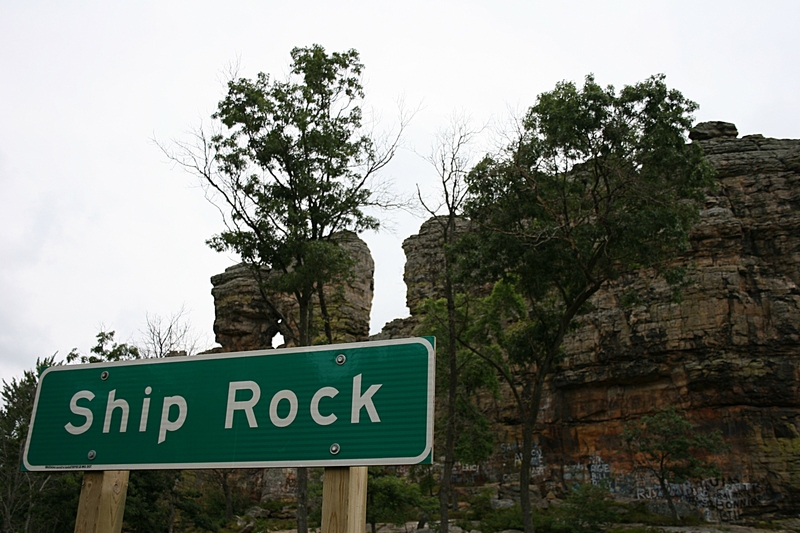 Whenever I pass by Ship Rock, which has been numerous times since my second daughter moved to Appleton, Wisconsin, in December 2010, I am awestruck by this isolated pinnacle of Cambrian sandstone. 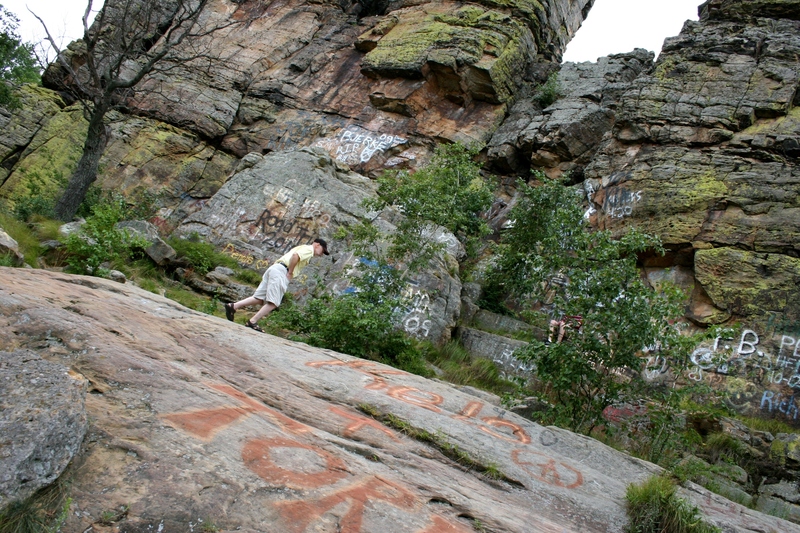 Finally, this past summer, my husband, teenaged son and I stopped to climb around the base of the rock cropping and to photograph it (me mostly photographing rather than climbing). 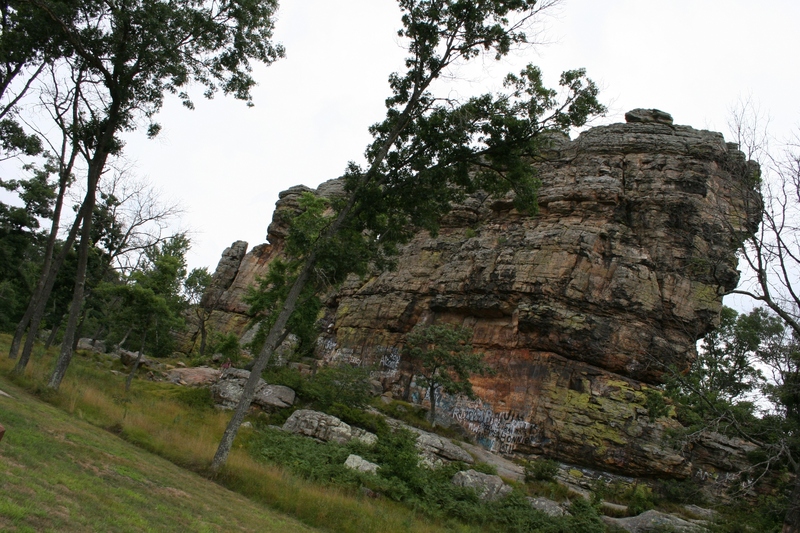 Ship Rock rises from the flat landscape, a surprise in the Wisconsin woods. My husband walks across the rocks below the looming Ship Rock. If you can ignore the distracting graffiti, then you can appreciate the nuances of the mottled stone, the ferns that tuck into crevices, the surprise of this Ship Rock docked in the most unexpected of places. The rock formation truly does resemble a ship. 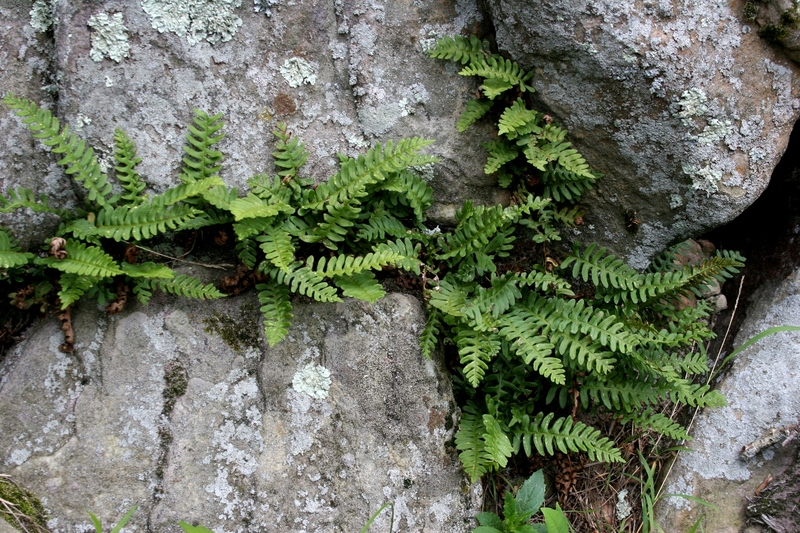 I am surprised by the ferns that grow in the tight spaces between rocks. 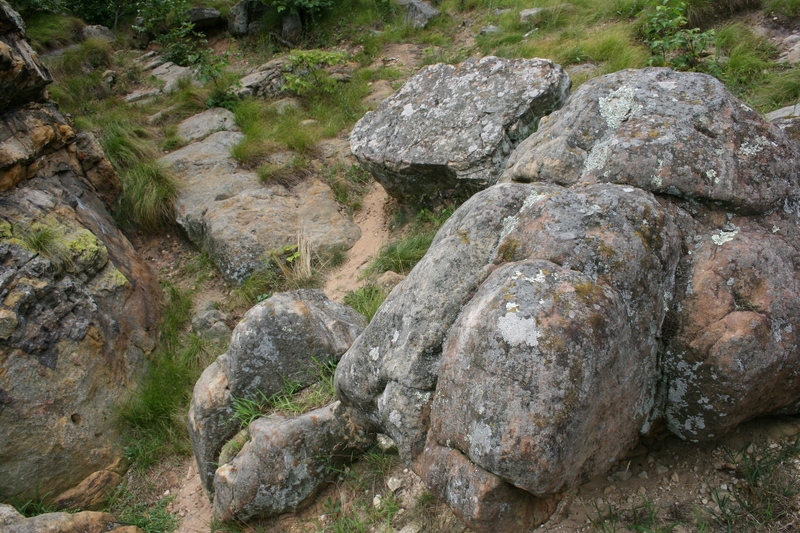 Grass sweeps between rocks in this August 2011 image taken at Ship Rock. A month ago while traveling past Ship Rock, I snapped a photo. The ship seemed forlorn and exposed among the deciduous trees stripped of their summer greenery. Yet she also appeared threatening, a looming presence rising dark and foreboding above the land awash in snow. I could appreciate her, even if she wasn’t a grain elevator or a water tower, a silo or a cluster of trees breaking a prairie vista. Ship Rock, photographed from the passenger window of our van at highway speeds in December. CLICK HERE for more information about Adams County, Wisconsin. MANY YEARS AGO I heard Minnesota photographer Doug Ohman talk about his Churches of Minnesota book, a project in his “Minnesota Byways” series published by the Minnesota Historical Society Press. He’s an impressive speaker, sharing his love for photographing those subjects which hold historical, community and personal significance for so many Minnesotans. Thus far he’s covered Minnesota churches, barns, courthouses, schoolhouses, cabins and libraries in his series. I don’t think I’ve missed any and I’ve read most. His books also include prose by well-known Minnesota writers like Will Weaver, Jon Hassler and Bill Holm. If you’re at all interested in the places that are so integral to our lives, you’ll want to read Ohman’s books and, if you have the opportunity, hear him speak. Buckham Memorial Library, built in 1929, features a Charles Connick stained glass window and Greek murals. 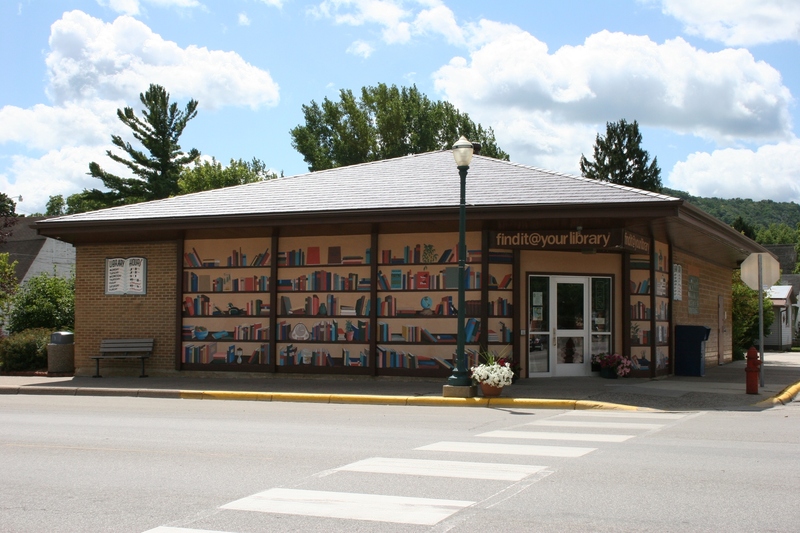 Thursday night, January 26, this noted photographer travels to my community of Faribault, to Buckham Memorial Library, to present “Free to All: Libraries of Minnesota” as part of the Minnesota Book Award Author Tour. His book, Prairie, Lake, Forest: Minnesota’s State Parks, was a 2011 MNBA nominee. I’ll be there for several reasons: I enjoy Ohman’s books. I want to learn more about his approach to photography. I’m interested in learning more about libraries in Minnesota. I appreciate libraries. He’ll be at the Faribault library at 6 p.m. for this free event. A photo of Buckham, by the way, is included in his Libraries of Minnesota. Southeastern Minnesota residents will have plenty of other opportunities to hear Ohman speak on his “Minnesota Byways” series as a dozen additional appearances are scheduled through-out the Southeastern Libraries Cooperating regional library system. Click here to view a complete listing of Ohman’s upcoming visits. His presentations will vary—from schoolhouses to churches to farms and more—depending on location. I’d recommend taking in one of Ohman’s presentations. You’ll gain insights into Minnesota history and photography and more from a photographer who possesses an unbridled enthusiasm for preserving, in images, that which is part of the Minnesota landscape. The Houston Public Library is on the cover of Ohman's book, Libraries of Minnesota. I shot this photo last summer of the library in the southeastern corner of our state. 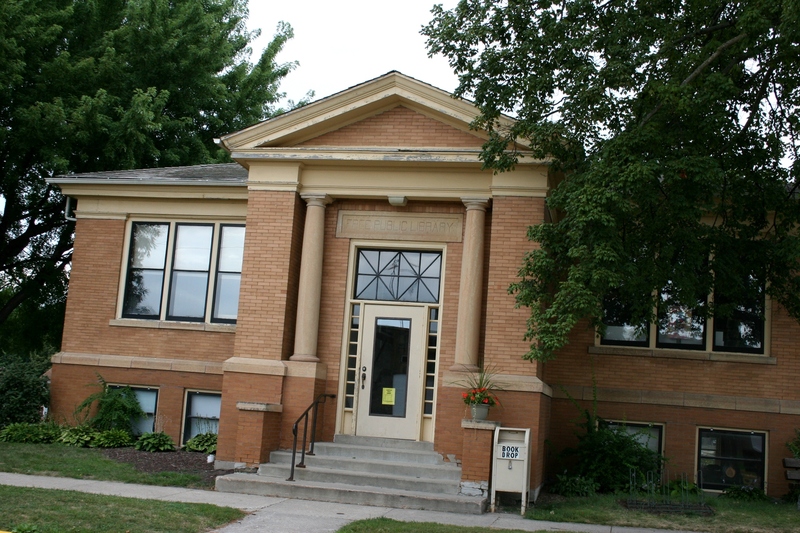 Built in 1912, the library in Janesville is an Andrew Carnegie library on the National Register of Historic Places. 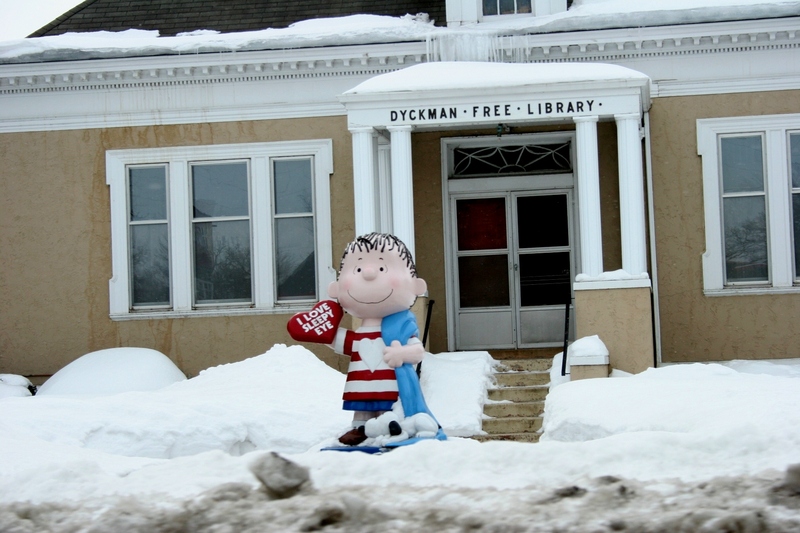 A statue of Linus greets visitors to the Dyckman Free Library in Sleepy Eye. Charles M. Schulz, creator of the Peanuts cartoons, based his character Linus on real-life friend Linus Maurer, a Sleepy Eye native. Maurer, a cartoonist, worked with Schulz. Ohman, who managed the former Camp Snoopy at the Mall of America, includes a photo of Linus at the Sleepy Eye library in his book. Several summers ago I photographed this 1930s Works Progress Administration log cabin in Hackensack. 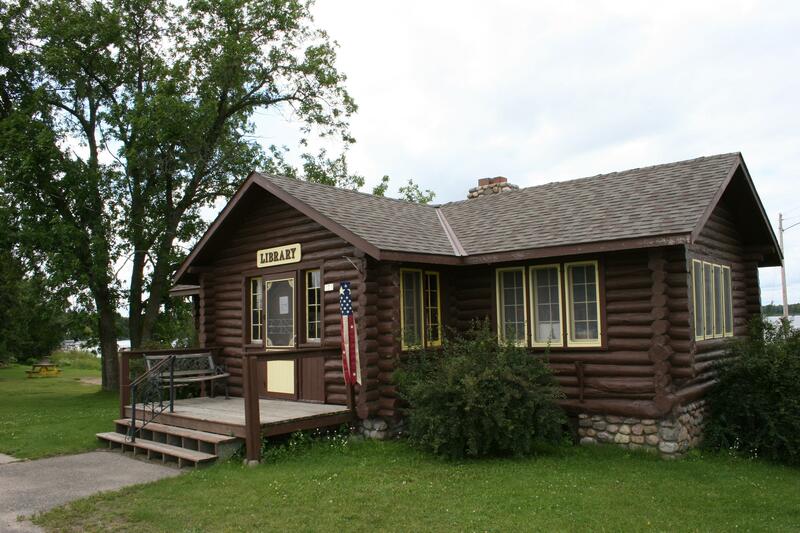 Sitting on the shore of Birch Lake next to a towering statue of Lucette Diana Kensack (Paul Bunyan's sweetheart), the cabin today houses the Hackensack Lending Library. IF YOU’RE INTERESTED in reading another book about libraries, check out Carnegie Libraries of Minnesota by Kevin Clemens. 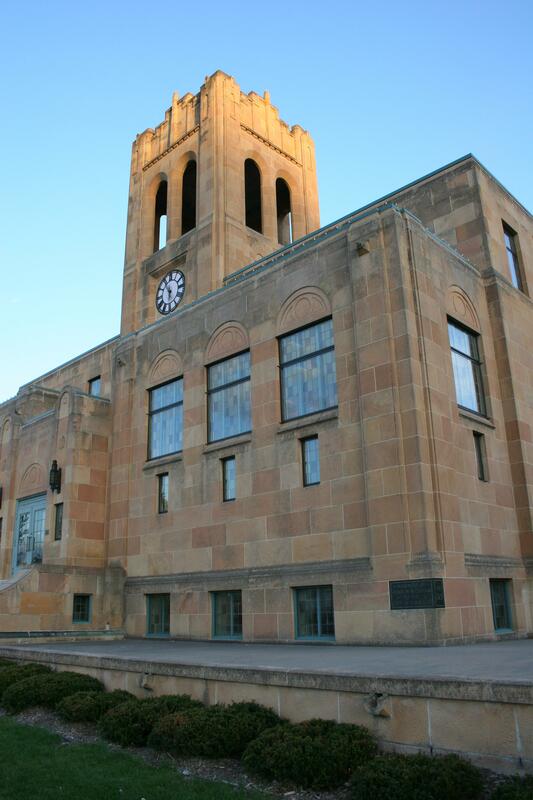 The book highlights the history and architecture of Minnesota’s Carnegie libraries, primarily in photos. Click here to learn more about the book. 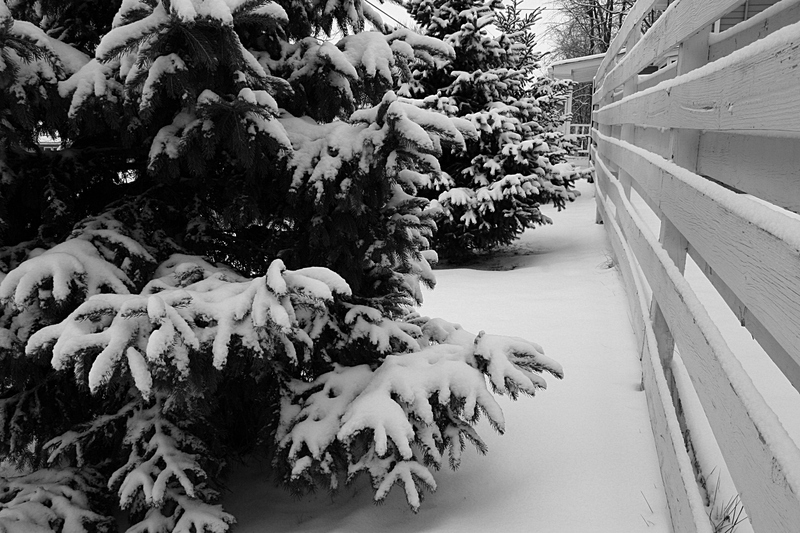 Even I'll admit that snow brings a certain beauty to the landscape, including this view of my neighbor's yard. AS UN-MINNESOTAN as this may sound, I don’t particularly like winter. I’d grown rather fond of the unusual 50-degree temps earlier this month and a landscape free of snow. Yet I knew better than to get all smug about the weather, realizing that, at any time, the proverbial shoe (or boot) would drop. 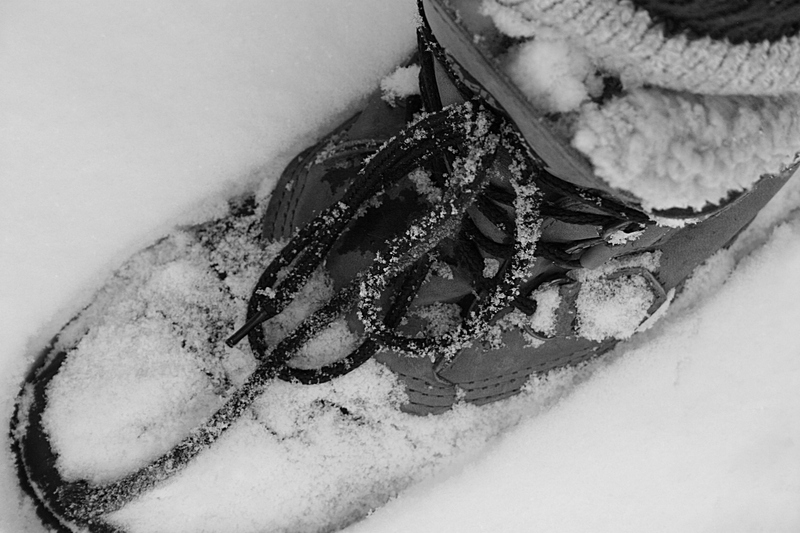 No fashion boots for me...I wear practical Northwest Territory boots. It did, with temperatures plummeting to below and barely above zero followed by two measurable snowfalls within the past several days. Snow means work, aka shoveling snow. Snow means walking with trepidation. I wasn’t always fearful of walking across snowy or icy sidewalks, driveways or parking lots. But then 3 ½ years ago I had total right hip replacement surgery because of severe osteoarthritis. I would like to keep that expensive ceramic implant intact for another 17 years. So I tread with caution, eyes locked on whatever slick surface I must traverse. I will myself not to fall. Thus far, the strategy has worked to keep me upright and out of the hospital. Despite my winter worries, I still shovel snow. However, I questioned the sanity of that effort on Monday as I crunched my way across the ice-glazed, snowy yard toward the sidewalk encrusted in snow and ice. 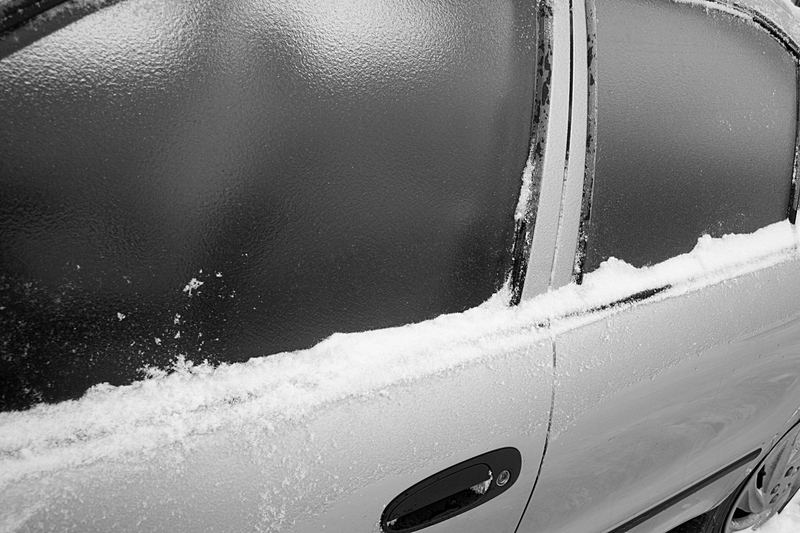 The car my son drives, encased in ice on Monday. Freezing rain fell before the snow. He walked to school. I didn’t exactly rush my way through snow removal. More like half-skated. By the time I finished clearing the sidewalk and the end of the driveway, I truly wanted to give up and leave the rest for the husband or the 17-year-old. But winter wasn’t about to defeat me. I may not like her, but I sure as heck won’t allow her to get the best of me. 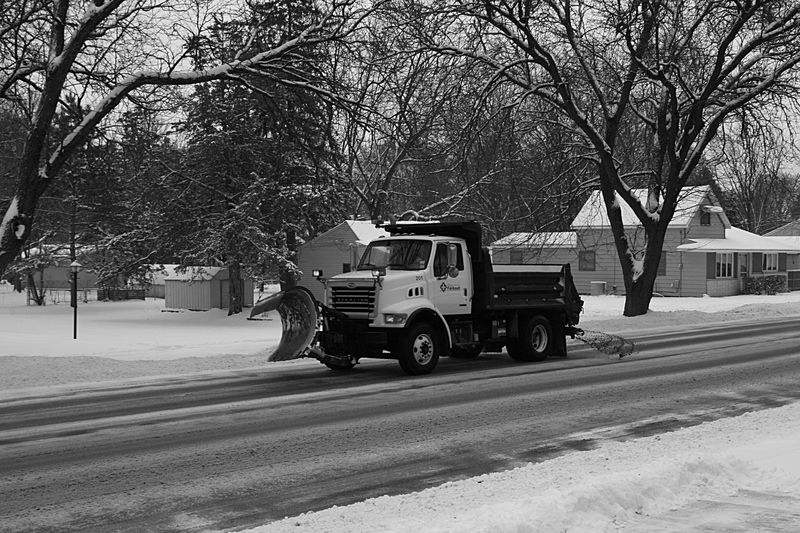 A city of Faribault snow plow spreads salt and sand onto the street by my house on Monday.